“A man of Integrity” is a phrase that can accurately describe Pastor Samuel Raymond Blakes. Pastor Samuel Blakes was called by God at a very young age and has been preaching the Word of God ever since. He is the youngest son of Prophet Robert Charles Blakes Sr., and Lady Lois R. Blakes. He is a loving father of two beautiful daughters. He has been the Pastor of New Home Family Worship Center in New Orleans, Louisiana since 1995 and Baton Rouge, Louisiana since 2008. Pastor Samuel Blakes is a graduate of St. Augustine High School of New Orleans. He then furthered his education at Southern University of New Orleans and received his Bachelor’s and Master’s Degrees in Theology from Christian Bible College in Louisiana. 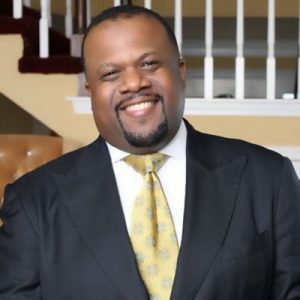 Pastor Samuel Blakes has extensively traveled to various parts of the United States and abroad evangelizing the Word of God to a lost and dying world. He is truly a man of vision, purpose and destiny and is filled with a substantial amount of wisdom, knowledge and understanding of God’s Word. Pastor Samuel Blakes is constantly walking in the wisdom of his father, Prophet Robert Charles Blakes Sr., and in the anointing of the Holy Spirit. He is determined to fill God’s people with the necessary principles for Spiritual Warfare by teaching the believer how to study and effectively apply the principles of God’s Word to their lives. Amongst his many accomplishments, Pastor Samuel Blakes is also a “National Recording Artist” and his first album is titled “I Survived”.